Six Dots is now two weeks old! 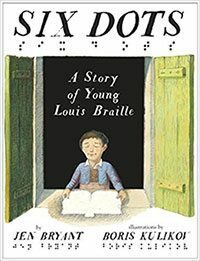 The creative team at Knopf, illustrator Boris Kulikov, and I, are delighted that the book has thus far received excellent reviews and three stars (from Publisher’s Weekly, the Bulletin of the Center for Children’s Books, and School Library Journal). You can read what the reviewers say about it. Also, in the week preceding publication, I did two very enjoyable interviews: one with author/ blogger/ reviewer Julie Danielson, which you can read here, and another with blogger/ reviewer/ bookseller Clara Martin, which you can read here. 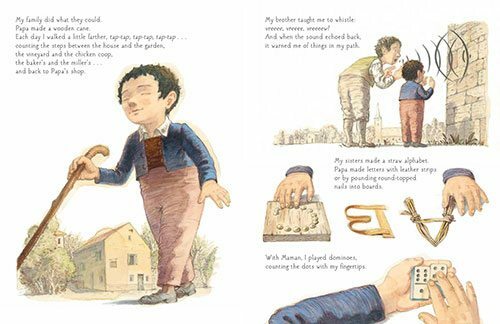 Both Julie and Clara asked interesting questions that made me reflect on the joys and challenges of creating this first-person narrative of a child-inventor, who revolutionized learning for the blind and visually challenged.